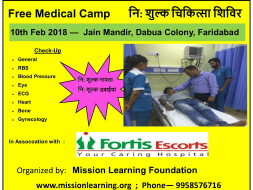 Free medical camp being organized by a Gurgaon based Volunteering Group - Mission Learning Foundation, in association with Fortis Escorts Hospital, Faridabad at Faridabad. All doctors are coming from Fortis Escorts Hospital. Free Medicines, Free Food to be given to all the patients along with free tests and gifts. 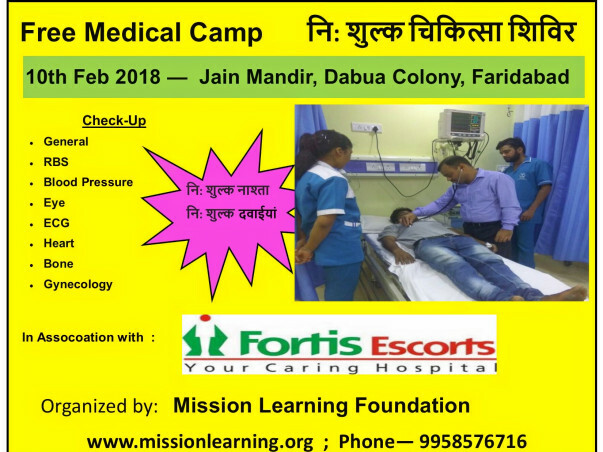 Volunteers of Mission Learning Foundation, is bearing the cost of the medical camp from their own pocket. Although, the cost being high, the team is in shortage of money. This is why this request campaign is being run. The last medical camp was organized in Gurgaon, and was appreciated by patients and doctors. Best wishes & keep up the good work.